I have long sought a clear view of a dipper hunting under water. Alas, repeated attempts proved unsuccessful. There was no reason to think that today would be any different. Certainly, the temperature had risen; the anchor ice was gone; and the dippers were back patrolling the turbulent portions of the creek which only a week earlier had been beyond reach. Now, the dipper’s restored access, some propitious perspectives, and good lighting allowed a previously eluded view. 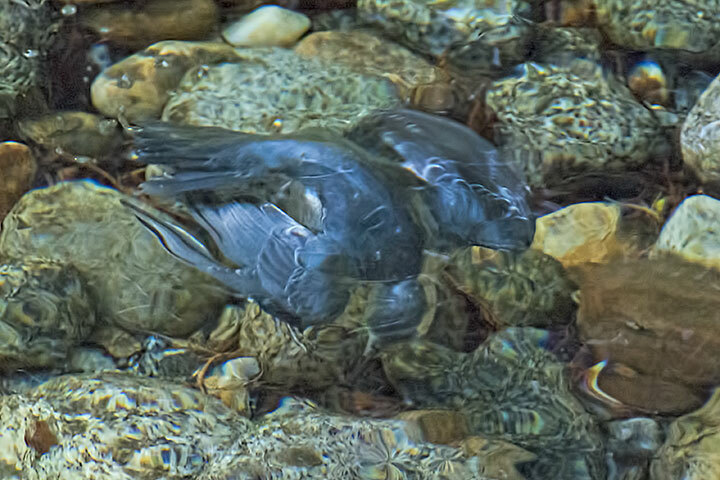 The successful shot shows a dipper flying under water as it hunts in a manner almost identical to that used by other birds that hunt in the air: wings out and head down as it scours the surface below. Astonishing image, Alistair. Well done! …Block out the wings and the tail appears entirely fishy. I hope to get to see this someday let alone photograph it..
Just when I think it can’t get better! What a great shot, your patience pays off.